Write in simple flames. The joy or horror. Or the boredom of it. Write any length sentences you want. Write strong and true. Try telling it, not showing it. Use short words with strong vowel sounds like mud and stuck. Matt Black is a poet, playwright and educator (working on commissions and in schools) who lives in Leamington, UK. He has done many interesting things so far in his life; to name just a few – he was Derbyshire Poet Laureate (2011-2013), is inventor of the world’s first Poetry Jukebox and also the Fanti-Elastical Zing Zong Poetry Imagination Machine and is currently reader-in-residence at the Tree House Bookshop in Kenilworth. Matt writes for both adults and kids, and likes to include beautiful, funny, moving and thought-provoking things in his readings. 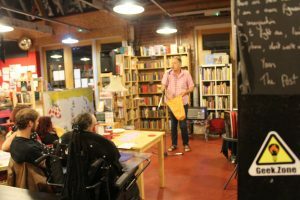 His recent published collections include Tales from the Leaking Boot (Iron Press, 2018), Spoon Rebellion (Smith Doorstop, 2017) and The Owl and the Pussycat and the Turtles of Fun (Two Rivers Press, 2014). Matt’s play The Storm Officer toured in 2018. 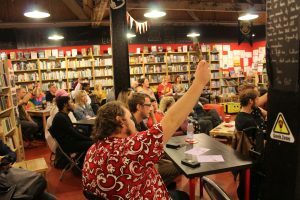 We don’t want to pigeonhole you, so – in your own words, can you tell our readers what you do and what they can expect if they come to see a Matt Black poetry set? It will depend on the night really. But mostly I aim to entertain people, to move people, to surprise and to provoke gently and to have moments of light. 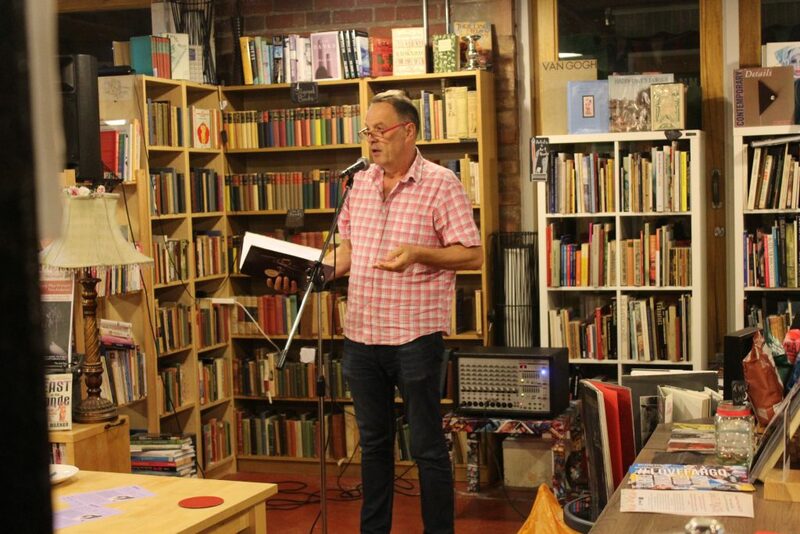 I want to push audiences slightly towards “I didn’t expect this” – to make poetry fun, but also make people think. I have no wish to tell them things they already know. I have a theory that people usually need to laugh at some points in a set in order to be open and ready for other feelings. In Spoon Rebellion, you mention that both your parents were artists – did they encourage writing and creativity when you were growing up? Not very specifically, but they did have lots of books in the house, and they did let me get on with it. They certainly encouraged creativity by their ways of thinking and being and talking. In fact, they did that at the expense of encouraging healthy emotional communication as a family. And it was the lack of healthy emotional communication which really took me to poetry. Along with the music of poetry, which I always loved. What inspired you to start performing poetry? 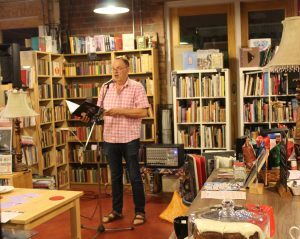 For my taste some poetry readings can sometimes be a bit strokey-chin and worthy even though the poems may be fantastic – and soon knew I wanted to find ways round that. I also constantly want to convert non poetry lovers to enjoying poetry, so am interested in how performance and consideration of audience can do that. I was making up my own performance techniques for cabaret events in my late twenties, and then saw John Agard who also became a big influence. And lots of other poets followed. Performance poetry vocabulary and techniques in the 80s and 90s are very different to the prevailing techniques now in some really interesting ways – not better or worse just interestingly different. Having experienced lots of Matt Black performances, at various events, we know your interactive style is popular with audiences. Were you nervous when you first started including audience participation in your work? Yes, but I always loved it. I love and need reaction. Find it hard to read to still and silent and giving-nothing-away faces!! Very disconcerting. I suspect it’s insecurity on my part. Are there any key themes or topics in your recent collections? Yes, “Spoon Rebellion” had a desire to celebrate small towns that are often uncelebrated and self-deprecating. I love small towns, and most people in this country live in them. Large towns and cities are buzzy and great in lots of ways, but they are not “better”. I feel we need to give due respect to all our small towns. “Tales from the Leaking Boot” is a very short book that contains comic and reflective haiku that worry about the absurdities of America, celebrates the joys of Turkey, and has deep love for Cleethorpes. Is it hard work being a professional poet? Do you have any tips for people on how to turn their craft into a livelihood? Yes, it’s hard work, but driven by the energy that amazing work gives you. Tips? Read widely, read widely, read widely, go to stuff, go to stuff, go to stuff, be visible, be visible, be visible, be humble, be humble, be humble, smile, smile, smile, turn up, do a good job, find out what you have to offer that other people don’t, go gently, go bravely, enjoy the journey, keep going. Do you read a lot of poetry yourself? Which collections have recently made an impression on you? Not as much as I should! Partly because I’ve come to love non-fiction as well, mostly history and science. But I still read poetry endlessly in a dipping in kind of way. Recently? All my mad mothers by Jacqueline Saphra, Assembly Lines by Jane Commane, Tony Walsh’s collection, Rob Auton, Love that Dog by Sharon Creech. 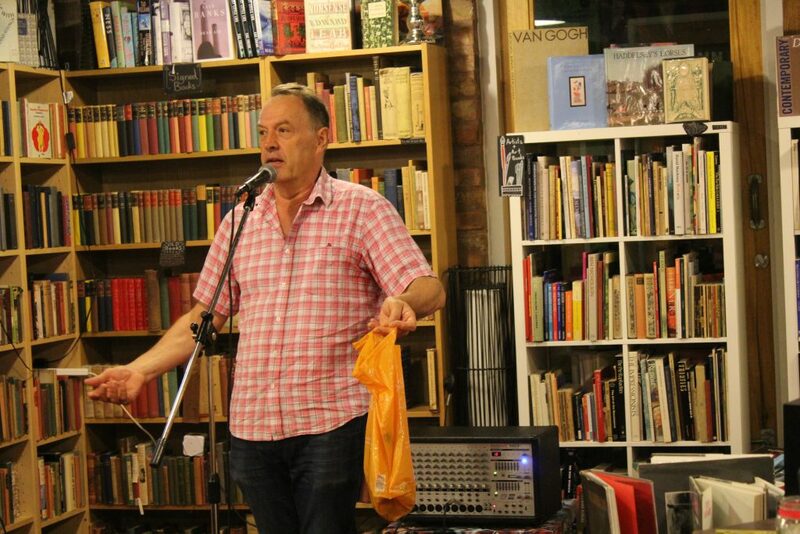 Is it as fun being reader-in-residence at the Tree House Bookshop (Kenilworth) as you make it look? Tell our readers about some of the projects you’ve done/are working on. Yes, it’s a dream job. Victoria, who runs the bookshop, is completely welcoming to ideas, and so I can just pretty much make up stuff and she says, Yes, great idea. I’ve recently been standing on Kenilworth station reading and performing poems to passengers waiting for the 8.09, 8.47, and 9.09 to Leamington and Coventry. I walk up to them, smile and say “Hello, I’m the station poet, would you like me to read you a poem?” and 95% of them laugh or smile and say, Yes, OK then. And lovely conversations take place, after the poem, and a few passengers have had poems written for them as well. Future ideas are a contemporary poetry reading and writing group, to run at 6pm on the evenings of PGR, with soup, and door to door visits round Kenilworth to read two minute versions of classic novels to people on their doorsteps. You’re well aware Coventry recently won the right to call itself UK City of Culture 2021, as you wrote the poem that featured in the Bid promo video! Over the next few years, what sort of things do you hope to see happening for writers here? More funded infrastructure for writers in the community, because writing does actually change lives, more outreach work to “hard to reach” communities, city-wide Poetry Slams in secondary schools, funding for Fire and Dust, more integration into curriculum development within primary and secondary, though that’s a tall ask in the current climate. Do you feel there’s a difference between writing for the page and writing for performance? Yes and no! Some poems work for both perfectly, some don’t work quite so well for both. Some techniques and modes work in performance, I think, but don’t translate quite so well on the page. And vice versa. 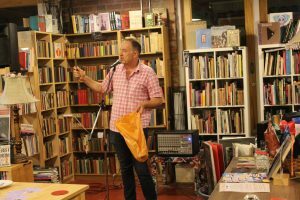 But it doesn’t preclude performance poems still appearing in books – they still are good to read, they are just more alive and more effective on the stage sometimes. It can vary. I love lots of different ways that gigs run. The main thing is genuineness and heart and care. In whatever way those manifest themselves. They manifest themselves beautifully at Fire & Dust. Where can people get hold of your excellent books?